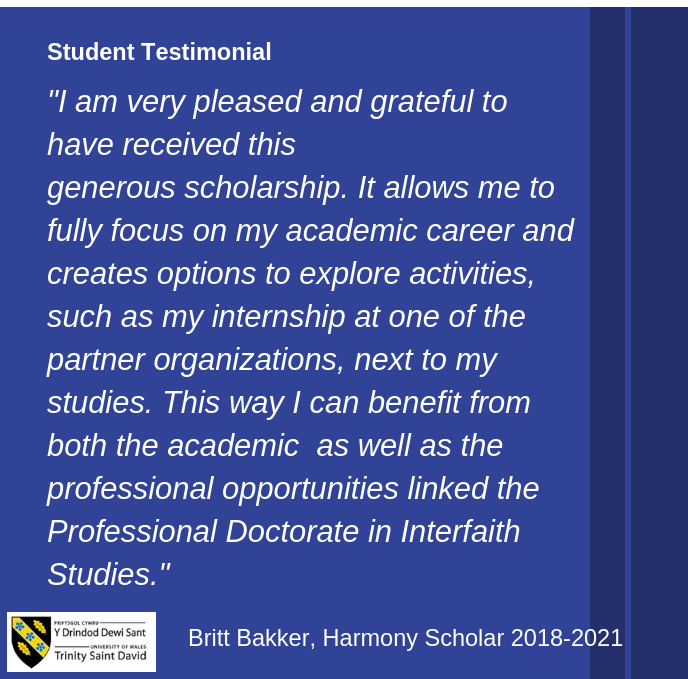 The Harmony Scholarships are provided for students to enter and undertake the three-year Professional Doctorate in Interfaith Studies, which was kindly offered by the Chin Kung Foundation. They are offered to high-quality students from multidisciplinary backgrounds, from around the world, who focus their research on interfaith studies. A proven track record of academic excellence, and potential to be an outstanding academic researcher. A Master’s degree in a relevant subject, although applications will also be considered from students who can demonstrate competence at Master’s level, an equivalent and appropriate professional qualification, or significant and relevant professional experience. Proficiency in a second language is desirable, but not essential. The doctoral scholarships will be awarded to students who intend to register for full-time study as on-campus doctoral students. Successful candidates will be awarded a scholarship of £15,000 per annum, consisting of tuition fees (£7,500) and a maintenance grant (£7,500). Further means-tested support can be considered on an individual basis. Scholarship holders will also be eligible to apply for student accommodation at a reduced rate on the Lampeter campus. The latest cohort of Harmony Scholars joined the programme in September 2018. Currently, applications for the Harmony Doctoral Scholarships are closed. Further updates will be made shortly.